The Embassy allows you to house allied reinforements. 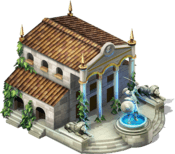 Upgrading your Embassy increases the capacty of reinforcements you can hold; the Embassy will not hold more than its capacity. Reinforcements pay their own upkeep.